The Keyboard Concerts series will be presenting the third installment of its World Music Series at 8 p.m. Friday, April 26 in the Fresno State Concert Hall. This event features the internationally celebrated Cadence Ensemble from Yerevan, Armenia. 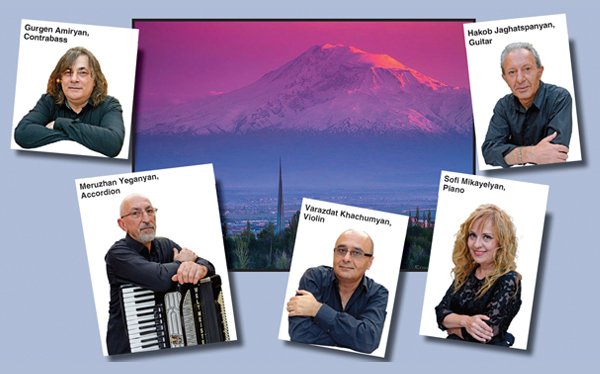 In 2004, these five outstanding Armenian instrumentalists formed their group with the intention of promoting the music of Astor Piazzolla. Following an enthusiastic response by the public and press, they continually expanded their repertoire and rapidly developed into what they are known for today: one of the world’s premier ensembles performing original works and arrangements by classical and contemporary European, Russian, Armenian and American composers — including world music and pop — while maintaining an affinity for Piazzolla. The ensemble has given acclaimed performances in numerous countries around the world in prestigious venues such as the Teatro Colón in Buenos Aires and the Mariinsky Theatre in Saint Petersburg. This event is co-sponsored by the Fresno State Armenian Studies Program; the Thomas A. Kooyumjian Family Foundation; the Armenian General Benevolent Union, Fresno Chapter; and the Orpheus Chamber Music Ensemble. General admission is $25, seniors $18 and students $5. For reservations and other information, call 559.278.2337.